Our monthly series on important health issues with feature RLMC’s outreach specialist , Dr. Elie Chalhoub. 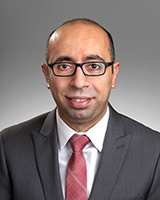 Dr. Chalhoub’s area of expertise is Oncology/Hematology. His discussion will focus on disease and disorders associated with this field, cancer treatments for 2017 and the day and life of an Oncologist. Free to the public! Everyone welcome. A light lunch will be provided. The event will be at the RRCC Theater. We thank RRCC for supporting this monthly event. On April 12th from noon-1pm.